We seek to offer hospitality and build community throughout our neighborhood. In the same way we might prepare our home to welcome a neighbor or friend, we have worked to create an inviting environment in our FCS office. We want to welcome everyone who walks through our door with dignity and joy. We are so grateful to Buckhead Church’s BeRich giving campaign for coming alongside us and supporting FCS when we relocated to our focus neighborhood. Their generous gift allowed us to raise the funds we needed to renovate and outfit our building to create a flexible and professional learning space. Recently, the finishing touches arrived as we welcomed new tables and chairs, whiteboards and a sound system. This space now better serves our community and visitors. 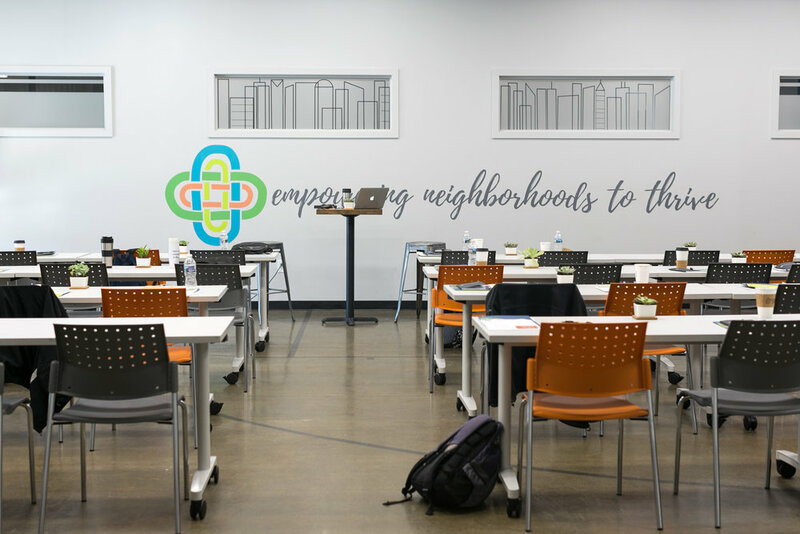 All our FCS Training events and Open Houses are held here, as well as our South Atlanta Food Co-op and some South Atlanta Civic League events. It is a gift to our work and our community to have this useful and comfortable working space. Thank you Buckhead Church and the BeRich Campaign!